I must confess something, knowing that this will not surprise some but for Sophie it was the news of the week. Living a day without butter seems so far fetched for her it is something she can not imagine. One time we searched for restaurants in Paris and when she read the chef of one high esteemed place takes a great deal of pride in cooking entirely without butter she immediately burst out in laughter I fear that particular restaurant will wait forever for a reservation from us! How can one survive without butter is the real question of meaning and purpose in life. Well we try it. My husband is on this trip with me and we give it a real try: the vegan life style. And we keep you posted how we do. We don't skip sugar but we cook and eat without any products from animals. First two days are gone by and we both feel less tired, energized one might say and kind of, YES, ‘happy’. I bought the new and fun cookbook by Nadia Damaso, Eat Better Not Less Around the World, and love not only the whole concept and beauty of the layout, the yummy recipies but also the link to Spotify. Yes, how awesome is that! Nadia travelled around the world collected recipes and ideas and while you cook you travel from continent to continent with her selected music. The ultimate idea of capturing all of the senses, worthy to be copied! Nadia is not only one of the most talented all-rounder: photographer, food stylist, recipe developer and healthy life-style influencer. She is absolutely authentic and lovable and … from Switzerland, where we live right now. When I made my version of Granola this morning the postman delivered a package and what it was, I will share later, my new gadget and I cannot wait to make good use of it. I might though have to wait for my son to show me how it operates, but then! Well, what I wanted to tell you was the postman almost didn’t leave the house this morning, my husband came to the kitchen and said, please let the postman try your granola he thinks it smells incredibly good and he made lots of comments. What is that smell? It is so unbelievably good! We are in Switzerland may I remind you, the birth land of Müsli! No one considers baked granola when you can soak your grains until they cream! 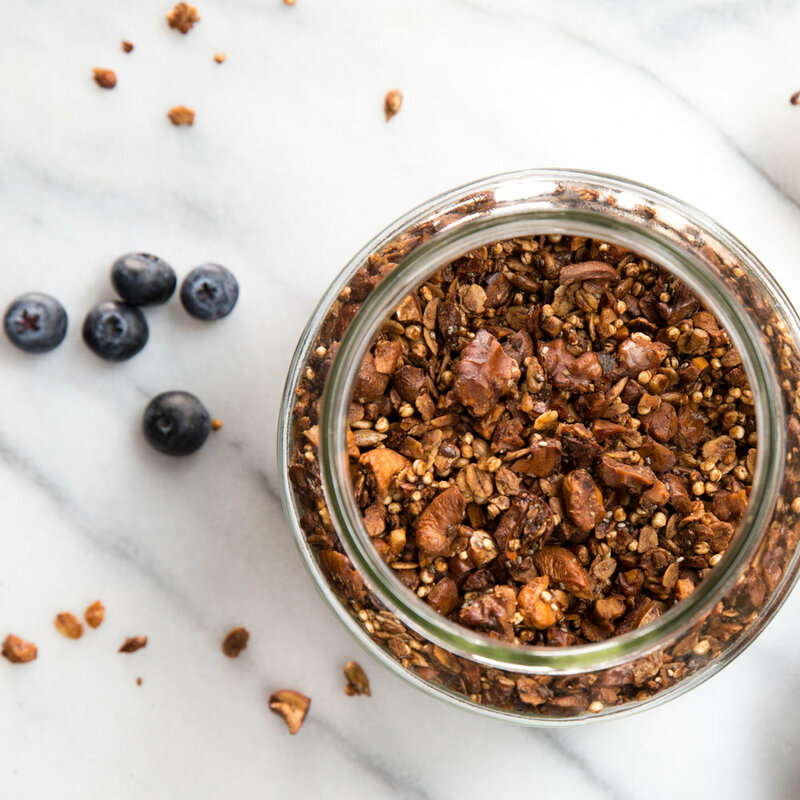 So I gave him a jar of this granola the recipy is below and you can now make it for yourself, just bake it in secret otherwise you might have hungry strangers hanging out in front of your house. Real fans! Heat the oven to 160°C on convection setting. Mix the dry ingredients except the millet, and stir in the coconut oil and the maple syrup. Now add the puffed millet and stir until well mixed, spread the granola on a lined baking sheet and bake for 25 minutes or until nicely browned. Remove from the oven and let cool. The Granola will keep in a tight jar up to a week. Everything goes in the blender, the frozen bananas will make the mix cold enough. 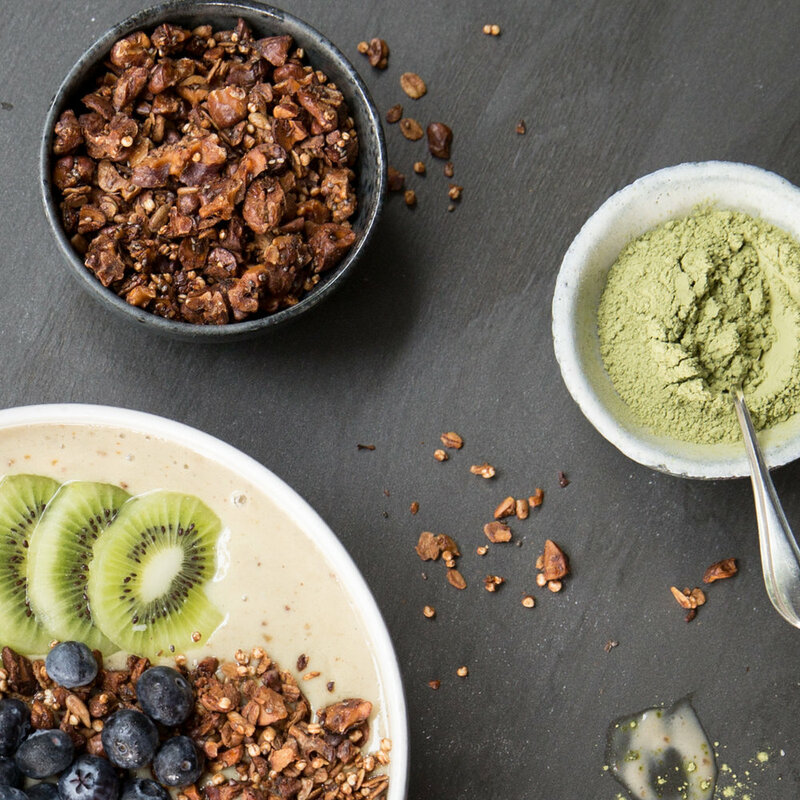 Now you can decorate your bowl with blueberries, kiwis and a good helping of the fine granola.